This is a signature design by Navajo smithing couple Happy Piasso and Rudy Willie which they execute in making both pendants and rings. They always use the finest grade of stones in these pieces which feature a border formed by starred buttons. 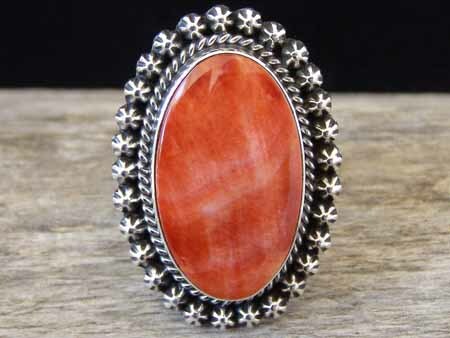 This ring is set with a thick oval of deep orange spiny oyster originating from the Gulf of Baja. This is beautifully polished with particularly fine coloration. Hallmarked H.Piasso and stamped Sterling inside the shank. Spiny oyster: 1 3/16" x 11/16"
Ring face: 1 9/16" x 1 1/16"